I shared this brief Christmas Story some time ago with you all and a good many of you commented on how much you enjoyed reading it and requested that I post it again this year. So here it is, I do hope you enjoy it. Two weeks ago the University of North Alabama Lions fell in the Division II College Playoffs on their home field in Florence Alabama. I mention this because I played on that football field as a young boy. In fact for a brief period of time, I lived right down the street from the current stadium. I used to go up there every chance I got, just to run up and down the field. Pretending to play college football and imagining victory’s won in the last second. And that got me to thinking about a Christmas I spent there as a boy….. I hope you enjoy it…..
At the risk of sounding like one of those old men I used to listen to as a kid harping on the youth of today, I have to say, some young kids today don’t realize how good they have it. Between the drive thru meals and the video games it’s no wonder they don’t have appreciation for those things in life one has to work and strive to attain. If you think I am pointing a finger at you, then you would be wrong. I am pointing at myself as well. In a little house close to the railroad tracks, just down the road from what is now the University of North Alabama. In fact, when the freight trains rolled by everyday the entire house would shake as if from an earthquake. We could feel the clack-clack of the big wheels against steel tracks and the lonely blasts of the horns as the endless trains passed. It was January and Alabama was hit with an unusually bitter cold spell. The silhouettes of lifeless trees looked like shadows against the grey skies. The blistering cold winds caused the entire house to creek as it labored to keep the heat of the fireplace trapped within its midst. I was six years old and I was living with a family that also had a grandparent and grandmother living with them. This particular Saturday two neighbors arrived and they were all warming themselves next to the fireplace in the little clapboard house next to the railroad tracks. As I recall there were a total of eleven people in that little house that Saturday. There were the foster parents, her father and mother, their two children, myself and two other foster children to work the fields and live stock across the tracks and the two neighbors from down the road. Eleven in all on this cold morning most of which were huddled close to the fire talking all at once about a variety of subjects. Myself and the other kids all about the same age just got in from feeding the hogs, the two cows and cleaning the stalls to find ourselves hurried to the kitchen for the customary bowl of oatmeal. I had other pursuits in mind…. I listened intently to his every story and asked a variety of questions all of which he answered patiently. His Daughter and son in law didn’t seem to care what he had done in the Great War and neither did any of the other grandchildren or foster kids. Me, I loved every minute of it. I called him Mister Chuck and he called me Sonny. In a loud and resounding voice shouting yes sir! I would be at his feet quick as a rabbit. I can still see him in my mind’s eye, setting in that rocking chair in his overalls, smoking a filter less cigarette staring into the fireplace as he told his stories; his mind drifting off to the battlefields of Europe and fighting the Hun. Mister Chuck was a good and decent man. There wasn’t much to go around for the foster kids in that house or anybody else for that matter. But Mister Chuck made sure we all got new socks and Miss Annie (his wife) had knitted each of us a nice warm stocking cap. But Mister Chuck had something special in mind for me…. Mister Chuck always carried tucked in his overalls, a Smith & Wesson Russian Model .44 caliber revolver. He would occasionally unload it and let me carry it and even let me pretend to shoot it. I would practice my sight picture imagining unknown marauders and the Kaiser’s Boys across the field, preparing to storm our defensive position. That pistol was almost as long as my arm and at the time felt like it weighted a metric ton. Anytime he would unload the massive revolver he would let me put those big .44 caliber bullets in my pocket and even carry them around most of the day. 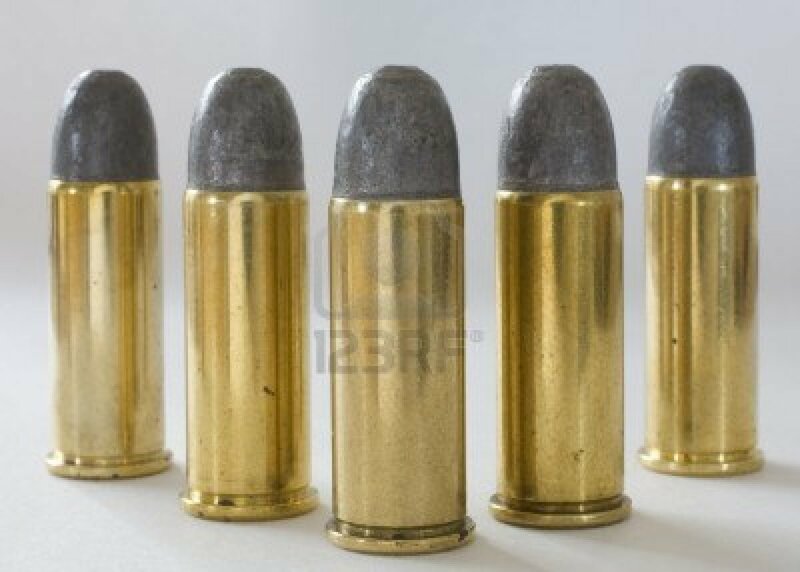 The bullets consisted of a huge chunk of lead attached to a real brass cartridge. I felt like an ammo carrier preparing to make it to the trenches to resupply my brothers on the front lines. So on this Christmas with no one around Mister Chuck said he knew how much I enjoyed playing with those bullets, so he gave me ten of the .44 Russian caliber bullets. He got down on the floor with me and told me to imagine them as soldiers and with my imagination they could be whatever I wanted them to be. It was an awesome gift. At night I would wrap them in an old handkerchief and put them under my pillow and during the day I carried them with me everywhere I went. I would play with those bullets every chance I got. I would line them up on the floor and imagining all kinds of warfare in far away and exotic locations. On this cold Saturday in January I was in a corner playing with my “soldiers” as the children ate their oatmeal in the kitchen and while the adults huddled near the fire place, some seated and others standing talking about whatever adults talk about. In the middle of the group set Mister Chuck, staring into the fire. I was in the process of relieving the beleaguered 101st Airborne Division at Bastogne in the corner of the room near a little table with my bullet soldiers, when the “incident” happened. The man of the house and the son-in-law of Mister Chuck left the fireplace and came over to the table where I was playing. As he retrieved something from the top of the table his boot hit my “soldiers” and sent them scattering. The man of the house saw the look of surprise on my young face and perhaps a hint of disgust as well. He then told me to get rid of them right now or I would get a beating. To this day I am not sure if everyone huddled around the fireplace heard the dispute, I know Mister Chuck certainly didn’t. Not that it has any real bearing on the rest of the story, but what happened next seem to start in slow motion. My feelings were hurt and yes I was embarrassed, but more than that I was mad. So with tears in my eyes, I gathered up my bullets in both hands and walked confidently towards the fireplace. I walked between two adults who were talking about something or another and unceremoniously pitched all ten .44 caliber bullets into the roaring fire. The moment was frozen in time. That was about the time the first rounds started detonating in the fireplace. I have never seen so many people running so fast in my life; how so many of them squeezed through the front door of that little house at the same time amazes me to this day. That little living room looked like the deck of the Titanic. While the crowd panicked Mister Chuck never left his rocking chair, I can still hear him laughing over the explosions in the fireplace. He was laughing so hard he was crying, despite the fact embers hit him from the explosions and left burning, smoking holes on the legs of his overalls and in the arms of his flannel shirt. I had a firsthand account of these events as I conveniently watched the fireworks display and subsequent scrabbling for safety from behind Mister Chuck’s rocking chair. By the time the last round exploded and with ringing in my ears and the smell of cordite hanging in the air, the crowd slowly made their way back into the house, and I don’t think I need to mention the adults were something less than pleased with my actions, even Miss Annie looked like she was thrown from a truck. Once Mister Chuck’s son-in-law came into the house, he grabbed me by the straps of my overalls and jerked me to me feet. Mister Chuck stood up from his rocking chair and calmly asked me what happened. When the Son-in-law tried to interrupt, Mister Chuck just held up his hand to silence his protests. In my fear I recounted the story and Mister Chuck nodded his head, patted me on the shoulder and said, nobody is whipping this boy today. Sonny let’s go get you some more of them bullets. I didn’t get a whipping that day, or any other day while I was in that home. Only Mister Chuck and I talked and laughed about the incident later, nobody else dared bring the subject up for fear of making the son-in-law mad. And we would erupt with laughter. Each and every time we talked about it, Mister Chuck would laugh just as hard as he did the day it happened and he would always say, “That was the funniest damn thing I ever saw”. I left there the next year and I never forgot Mister Chuck and Miss Annie. I didn’t see a lot of Mister Chuck as the years moved on and I kept up with them as best I could as I was growing up. But Mister Chuck never forgot me. He made sure before he died that “Sonny” received the pistol he loved so much as a little boy. Sometimes everything works out just like it’s supposed to.